Conceal blemishes and illuminate your face with Cowgirl Dirt's new Mustang Concealer. This color corrector hides the dark circles and brightens the eyes. The unique lightweight but concentrated powder is perfect for smoothing the complexion and covering skin imperfections. Use with Concealer Brush for seamless results. 2 gram container. Comes with a sifter. I just received this and have been able to use it three times and I absolutely love it! I have a fair to medium complexion with cool undertones and I am really liking the color sand. It brightens my under eye area beautifully and has just the right amount of coverage. Light, yet great coverage for dark circles. Conceal your blemishes with the best ingredients. Zinc Oxide: This natural UVA and UVB protection helps keep your skin healthy and protects against damage from free radicals. Titanium Dioxide: This natural ingredient helps keep your skin protected from the sun and is gentle enough for all skin types. Sericite: This natural ingredient provides a translucent reflection of light giving your skin a natural, glowing look. 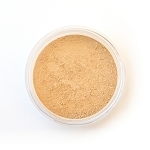 Cowgirl Dirt Concealer has a the perfect texture to help make application a breeze. 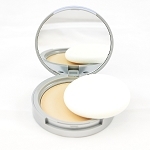 Start by using Cowgirl Dirt’s Concealer Brush and lightly coating it with Concealer. Gently cover any problem spots or blemishes in a swirling, dabbing fashion. Dab the concealer on and blend in with the Foundation Blush. Once the concealer has been applied in all the desired places, even out your overall skin tone by applying a coat of foundation (Pressed, Mineral, Liquid or Cream) over your face. If you find that you need a more concentrated exact coverage, try lightly wetting the Concealer Brush before applying the Mustang Powder Concealer to it. 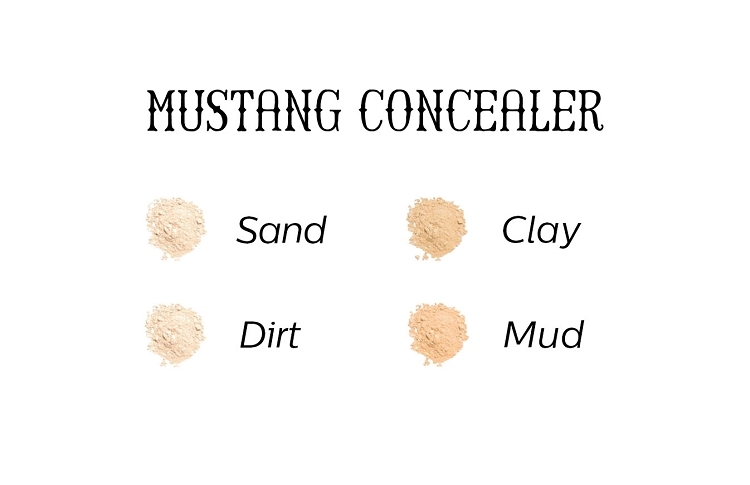 Mustang Powder Concealer comes in four shades. The shades are perfectly formulated with a mixture of all tones to help perfectly blend with any skin tone.